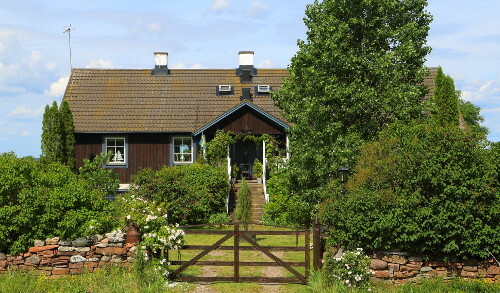 Welcome to rent your holiday house on Baltic island Öland, Sweden! Ekerum is located on the middle of Öland's west coast (see map on the photo album page), about 10 km south of Borgholm with its castle ruin and the Royal family's summer residence Solliden, and about 20 km from the old Hanseatic town Kalmar, which is one of Sweden's most beautiful cities. 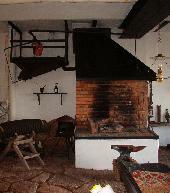 In the lower part of the house, a duplex house built in 1916, are the smithy and wagon workshop of the former Ekerum farm. The residential part, 2 floors with balcony with view over Kalmar Strait, is divided in 2 apartments, of each 5 rooms and kitchen, 8 beds, 120 m2. The apartments have separate entrances and balconies. The apartments are modernly equipped (TV, refrigerator/freezer, electric cooker, microwave oven, hot water, 2 showers/WC, laundry machine), yet they retain a certain charm. The house borders on Ekerum's 36 hole golf course and country club, with Ekerum's art hall, spa, restaurant et c.
Along the road down to the sea and the Ekerum beach (1 km) lies the nature reserve "Halltorp's Hage" with its 1000 years old oaks and unique flora and fauna. 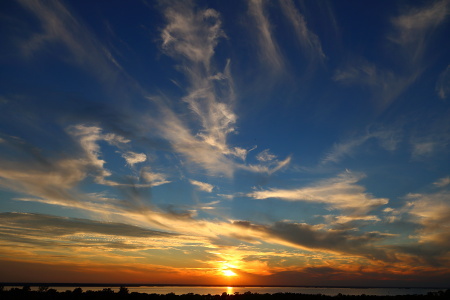 While every season has its own charm, it could also be a good idea to visit Öland before midsummer. Then, the nightingale, which inhabits the deciduous forests surrounding Ekerum, sometimes even visits the garden to sing! Grocery stores are located nearby in Rälla and at Ekerum's camping (1 km). A bus stop is a couple of hundred metres from the house. Situated 1 km to the north is the well-reputed "Halltorps Gästgiveri" (Halltorp's Inn) and the VIDA art hall. If you go to the east, you'll find Karum's Alvar ("Alvars" are an unusual kind of flat grazed moors with flat limestone rock breaking through the thin soil) and Himmelsberga museum to be close. You're welcome to contact Emanuel Mair for booking or if you should have further questions.